If you’re going to buy a True treadmill, then the True 500 HRC Classic treadmill should be on top of your list. 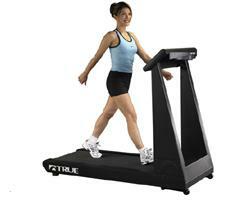 If for some reason you don’t want any other treadmill brand other than True, then this is the unit I recommend you buy. Considering its price, this is arguably the most feature-packed True treadmill today. Plus, it still comes with the best belt and deck combination in the market to give you the smoothest and most silent treadmill experience. This model boasts a 3.0HP continuous duty motor that serves up speeds of up to 10mph and inclines that reaches 15%. So it doesn’t matter whether you’re a beginner or advance runner, the True 500 HRC classic can provide you the intense workout you need. The 20” x 52” running space is bigger than what the 450 HRC classic is offering. This wide running area will give you more room to move and be comfortable during your workout. Plus, with its magnificent belt and deck combination, this unit could very well provide you your best treadmill experience ever. This treadmill also features heart rate controlled (HRC) workouts. It has 2 custom time-based heart rate files so you can create and save multiple workouts for easier usage next time around. Other heart rate features include a Cruise Control program which allows you to jump from any preset or manual workouts into an HRC workout, and Express Command Keys for simple access to any custom workout programs. There had been some complaints regarding this True’s heart rate features. First of all, the console shows limited information during an HRC workout. And secondly, while you’re doing a heart rate workout, only the treadmill is allowed to adjust your intensity. If you try to adjust it manually, the machine will shut down and halt your exercise. If you really need to own a True treadmill because of their smooth and quiet operation, I recommend you buy the True 500 HRC Classic treadmill. It is the best treadmill in the True lineup. But before you buy, you might want to compare it first to other best treadmills so you can make the best buying decision possible. If you plan on buying a True 500 HRC Classic Treadmill, I suggest you locate a dealer near you through Amazon. It is currently being sold for $2,795.